Recently we heard that the RSPCA had found a new home for Bobby. Today was the day for Bobby to move. Bobby is an RSPCA cat we were foster parents for. We caught him ourselves with the cat trap we are borrowing from the RSPCA for their projects. This specific project is of an old people’s home where a few cats became to a lot of cats in a very short time. What started with about 3-4 cats from people living around the special house and perhaps a farm plus some feral cats, became a family of 10-15 cats and kittens. That same project is still not finished, there are unfortunately still males and females running around there that will make it into a lot more cats this year. The mother of Bobby we knew as well, but sadly she got run over last year. This old people’s home is next to a busy road for all sorts of traffic in town. We might have to catch the rest of the cats this year. Anyhow, Bobby we caught sometime in the end of Autumn, beginning of Winter 2016 with the cat trap. We took him to the veterinarian clinic with the trap and got the required package of stuff such as neutering him, a tattoo in his ear and the necessary health checks. After that he went to our house and in the bathroom as we usually do with them. They tend to stay a while underneath the bath tub until they slowly start to get used to us and get out. This one, however, did never really get used to us. Whenever we saw Bobby, or he us, he hissed and spat at us and was stricken with fear. Some day he broke out of the bathroom with brute force, pushing the door open and running downstairs. It didn’t really change all that much for the first few months. We had to clean the room such as vacuum cleaning or washing the floors from time to time (normal housework) and he ran for his life to the other end of the room – or back upstairs etc. Only the last two months he has been coming out a bit more while we were sitting in the room playing video games or eating dinner. We even managed to shoot some closer up pictures. But we have never been able to actually touch him, stroke him or have him close enough to even let him sniff a finger. Any too fast movement meant he would run away and go back underneath the sofa. I managed nearly to get him to come to me, but well.. not enough. He still was too scared. He had barely any problems with other cats though. He played often together with both Felicia and Angel, running after each other through the house or slapping each other at different places: typical kitten-play. He also came out for food and drinks whenever we weren’t near him. He even recently started going on the bigger toilet of the three in the house, resulting in that I could remove one of the cat toilets from the main living room. As we had planned to go for some shopping in a bigger city, we had made the arrangement to take Bobby with to town to meet up with the new owner. Once again we had to have the fun of getting a feral cat this morning. It took two to catch one very afraid and feral cat. After about 10 minutes we managed to keep him contained in one side of the hallway. There I sat with the cat carrier ready for him, while Theresa tried to get him out of his hiding position. The hiding position was a shoe rack. After removing said shoe rack he came running out and walked right into the cat carrier. No one got hurt this time, only Bobby got afraid. He apparently doesn’t really want to hurt us but just wants to make a scene and show/appear as if he is a big tough guy. The car drive for 1.5 hours started with him panicking and doing a nr 1 and nr 2 in the cage. Poor us who had to smell that the rest of the trip, poor him for having to feel sorry for himself. We opened the window a little and drove onwards. The new owner was very happy to see Bobby. Bobby was less amused, perhaps sick from a long drive and now had to go for another long drive to his new home. Apart from having a talk with the new owner, we had one more task remaining: getting Bobby to move to his new cat carrier (bigger and owned by new cat owner). It however didn’t take long for him to move into the new box. It was a bit of the right technique (keeping the holding container somewhat diagonal towards the new opened container) and a bit of Bobby’s unwilling willingness to move over to the next box. 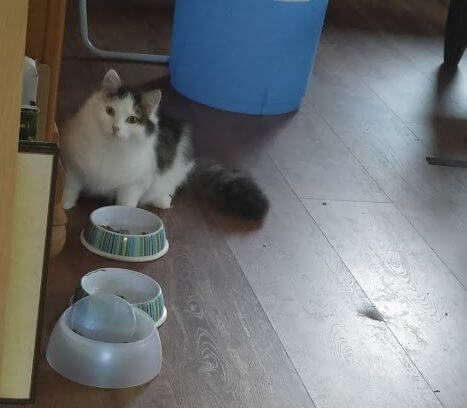 Bobby has made it safely to his new location, probably he is living again under some sofa. He will join another cat and a dog on a farm. When he gets adequately used to being there and getting fed there, he will probably live partly inside, partly outside in a shed of the farm. We of course returned safely home. We put the cat box in the trunk – far away from us – so we didn’t have to have the smell for the trip back. It feels somehow a bit emptier and more peaceful at home. Still three cats of the RSPCA remaining plus our four cats. Thanks for staying with us Bobby! Have a great life with your new people and at the new location!